Having won thirteen national titles and seven national cups, Budapest Honvéd FC firmly belongs in the elite of Hungarian football. 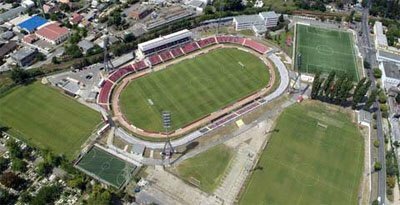 However, more than for its domestic achievements, Honvéd is known for providing the nucleus of the Hungarian national team in the 50s. Often referred to as the "Light Cavalry" or the "Mighty Magyars," this Hungarian team revolutionized the football world and served as a stepping stone to the Total Football philosophy. 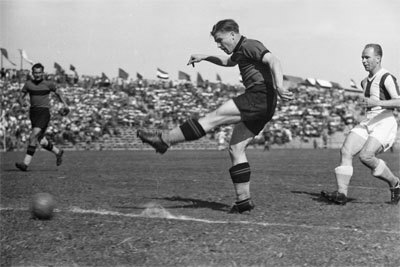 Puskás in Honvéd in a match against Újpest.. The club was officially formed in 1909, in the small Hungarian village of Kispest. Being a small and unassuming village team during this early period of their history, Honvéd did not see much success right away. Their only taste of silverware during the first four decades of existence came in 1926, when they claimed their first Hungarian Cup (in Hungarian Magyar Kupa). In 1949, the club was transformed into the Hungarian Army team; shortly thereafter, Kispest was absorbed into Budapest. The idea behind the takeover was that Honvéd would serve as a training camp of sorts for the Hungarian national team. The experiment quickly proved to be a successful one; led by the unstoppable trio of Zoltán Czibor, Sándor Kocsis and Ferenc Puskás, Honvéd went on to win five national titles during the 50s. These Honvéd players was an important part in the Mighty Magyars, the nickname of the legendary Hungary national team that become Olympic Champions in 1952, Central European Champions in 1953, and reached the final in 1954 World Cup. This golden era came to an end following the invasion of the Soviet Union into Hungary in 1956, which led to Czibor, Kocsis and Puskás departing for Barcelona and Real Madrid. With only a single Hungarian Cup trophy in 1964, Honvéd was far from a powerhouse during the next two decades. However, a new light shone on the club with the appointment of Lajos Tichy as manager in 1976. This led to Honvéd's dominance in the years that followed, with the club claiming eight national titles and three national cups in the period from 1980 to 1996. Honvéd's Bozsik József Stadion, home of the team for over a century, thanks to at least six renovations. The early 00s saw the club endure financial hardships, which eventually resulted in a relegation to the Second Division. After returning to the top flight the following year, Honvéd won another two Hungarian Cups in 2007 and 2009. Kispest (at the bottom) is the name of Budapest's district that Honvéd call home. Actually, the name of the district was practically the name of the club as well from 1909 until 1949, when “Honvéd” (meaning “homeland defense”) first appeared. From 1991 to 2003 both words formed part of the official name of the club. Since 2003, “Kispest” has given its place to “Budapest” in the official name, but has kept a place on the logo. The star on top corresponds to the more than 10 championship titles the club have won.